It took me a long time to warm to Poulnabrone Dolmen. 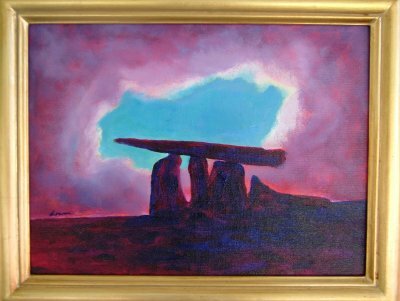 When I was younger I played on collapsed dolmens in the Wicklow Mountains and wherever I came across them. But Poulnabrone was too perfect, upright, with a thin sculpted slab across the top. I'm not sure when I did take to it - probably the day I saw two hundred tourists at it as we went past and then nobody at it in the evening as we stopped for a look. As a general rule, rain jackets that are not in sympathy with the landscape should be forbidden.